What's Eating Jdavies? : What? No iPhone Stock? 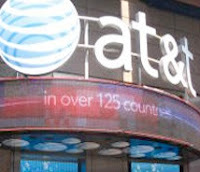 Mike Schramm noticed that an AT&T store he visited does not prominently display the iPhone. He proceeds to explain that the iPhone sells seven times more in Apple stores than in AT&T stores. I think it's a hasty argument pinning the reason why Apple sells more than AT&T just because the iPhone is not displayed in the one store that he visited. One store or two, doesn't hold significance in marketing, imho; I'm talking percentages here, buddy. Interestingly, there is a point about product presence in the point of sales, and that is pretty basic. No product, nothing to push, no sale. We never know, it could just be a supply problem - or a deliberate push toward selling other phones with other plans for that store. Numbers might be needed elsewhere in the chain of products. I think it needs to be determined whether AT&T has an active policy or script that determines the next device to push in the event of no stock scenarios. How many potential iPhone customers can be converted to buy other products? Is the iPhone the first offer to the customer, or is it more efficient to let Apple handle all the advertising, and sell it as gravy?